Looking back on the weekend just gone and amongst the fuzzy warmth of a hugely enjoyable experience is a strong sense of inevitability. 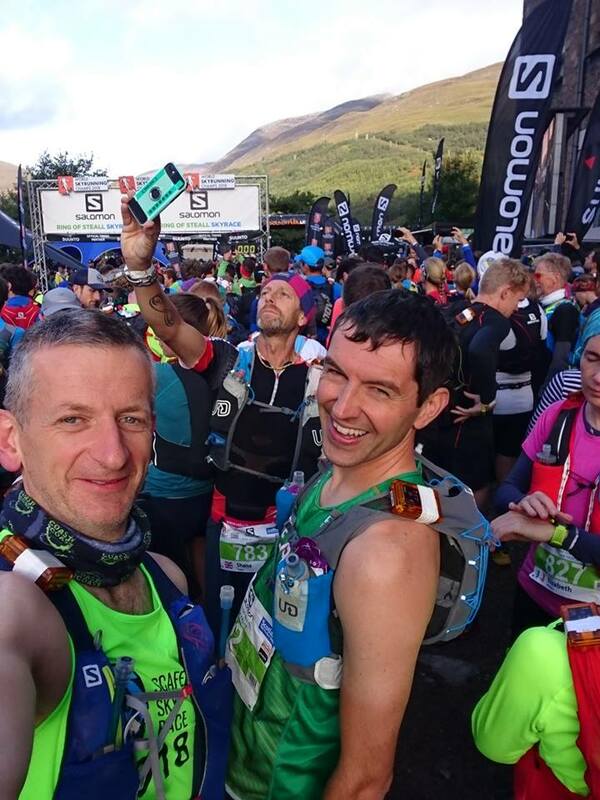 My result at the Ring of Steall Skyrace was entirely predictable, with a comfortable top forty position and a time suitably close, but never challenging previous winning efforts. A 33rd at the WMRA Long Distance World Champs back in June whilst in similar form showed me where my abilities stand among the genuine elites of mountain running, and regardless of fitness, my total lack of knowledge of the course on Saturday was always going to be a fairly major hindrance when considering optimal pacing and the psychological advantages of familiarity. 37th in 3:47:32 is suitably satisfying whilst not being overly exciting, seven minutes off predicted time but very much at the pointy end of a race boasting over eight hundred competitors. Start line selfies, ready to go! What did come as rather a shock was my utter annihilation at the hands (and legs) of the world’s finest mountain athlete. Kilian Jornet likely needs no introduction to the readership of this blog with a CV boasting numerous wins, records and FKT’s at the most famous and prestigious of events and challenges, but despite all evidence to the contrary, deep down there was a part of me that thought maybe the hype outweighed the talent. I was wrong. We live in a world where media makes heroes of half-wits and ‘legends’ of the mediocre but it seems that in this instance the subject of all adulation is well worth every plaudit. Jornet put forty-three minutes into me whilst knocking twenty off the previous record, a truly outrageous achievement that was subsequently dwarfed by him winning the Glencoe Skyline race the following day whilst I declined even a short jog to flush my aching joints. As someone who has dedicated a lot of time, effort and supposed sacrifice to honing my body for rapid mountain movement it’s a sobering realisation that I’m over 20% slower than the GOAT. The age old argument. I’d love to believe that genetics is at play, that regardless of decades of training and lifestyle choice I’d always be physiologically predisposed to such inferiority, and to a degree maybe Jornet is a mutant specimen, after all, there have to be outliers on the graph. To rely on this explanation does him a disservice though, whilst allowing me the luxury of avoiding the uncomfortable truths, there’s no extra twist to his DNA strands, he’s simply better because he works harder. I read recently that Tom Owens reckons he has no discernible natural advantages and that all his achievements come from training smarter than most. Tom is a machine and an athlete I admire greatly, so to hear that statement from such a talented mountain specialist brought home to me the deficiencies in my dedication. I’ve always believed that I put heart, soul and 100% commitment into my physical conditioning but the fact is that I could probably work harder and further advances could undoubtedly be gleaned if I fully immersed myself in training. So whilst nature may not be the root cause of Kilian’s superiority, you have to consider his nurture. From birth he has been engaged in extreme activity in mountainous environments, developing that innate and unwavering belief in the quality of his footwork, a oneness among the peaks, physical harmony with oxygen depletion. Despite my own life always revolving around a love of various games and activities, I certainly haven’t served his apprenticeship. I came to mountain running just eight years ago, already into my thirties and with very limited previous experience. I’ve definitely tried hard, trained lots, dieted, up-skilled and wrung what I can from my ageing muscles but life always takes precedent and jobs, businesses and my boys have rightfully imposed themselves on my time. Could I challenge if I was a full-time athlete? I’d certainly be closer but never very near, the path of my life was never going to facilitate a body to rival the best. So obviously it was my parent’s fault, for not living in the Pyrenees, for not encouraging me more than they did to roam among the crags, peaks and pastures of a high-Alpine environment and for not introducing me to the joys of fell-running. Deflecting blame for personal shortcomings is what we kids do, even when tipping the wrong side of forty! I always felt that if Kilian Jornet came to race in the Mournes I’d have given him a run for his money, using home advantage to keep him in check, how unbelievably wrong could I be? He’d simply jog away on the first climb and I wouldn’t see him again til he was tucking into the buns and soup at the finish. I’d love to see what he could do to the Mourne Skyline or the Seven Sevens, I’m guessing it’d be mind-blowing. So what about the Ring of Steall? Well it was a truly amazing race for so many reasons. The route, spectators, marshals, course marking and many other factors were so spot-on. 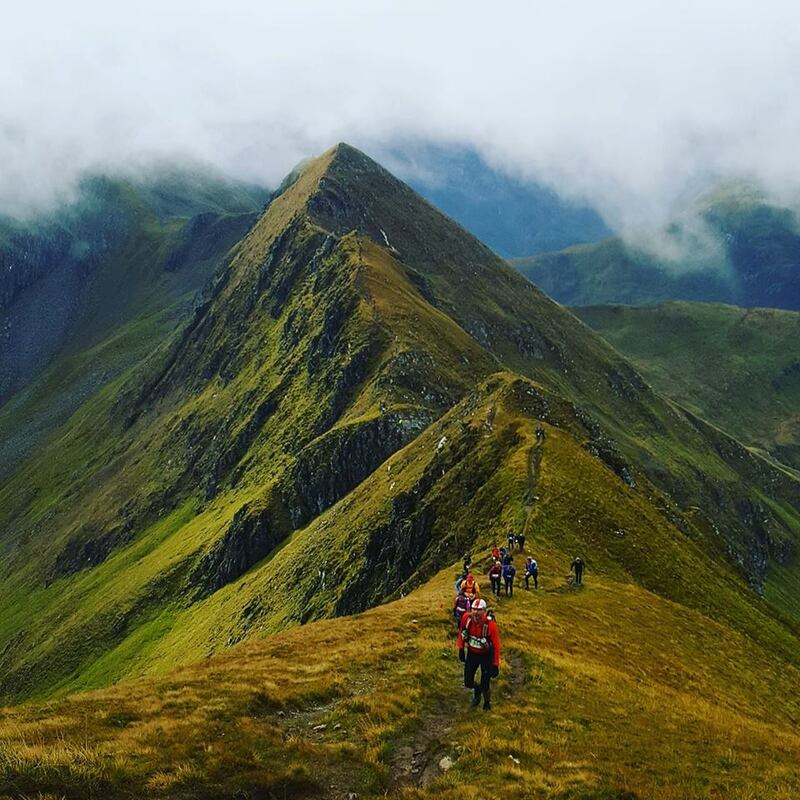 29km of steep, technical, rocky, boggy, loose and challenging terrain with an unmistakable sense of being among the glory of high peaks. Occasional views snatched between pockets of fog and an obsessional scanning of the trail ahead. Snippets of conversation and laughter with the hundreds who lined the course and a grin that got wider and wider throughout. I’ll spare the details, they’re personal to me, but experience once again aided my enjoyment as I started steady, passing the water station in 55th before running virtually every step from the river to the final checkpoint, picking off nearly twenty competitors who’d neglected to reserve as much as I had. I descended tentatively whilst tanned Europeans freefalled like lemmings in some of the most outrageous displays of downhilling I’ve ever witnessed. I’m no slouch on the drops but memories of multi-coloured blurs, scattering scree and pinpoint overtaking will last long. One such madman pulled off an impossible save from the jaws of a hospital ward, somehow getting a foot under his chin before it crunched into solid rock, another wasn’t so lucky, fit to walk down but not to continue. Such total abandon is alien to me, maybe the killer instincts of competition aren’t as honed in my psyche as I thought. Ridge-line running is pure smile-inducing pleasure, the air under your feet and the heightened awareness of primal survival instincts. Spot the wee orange flag and skip towards in any manner feasible, feet, hands, skittering crab-like with a flaccid soft-bottle gripped between teeth, all limbs required to stay rubber-side down. I get it now, Skyrunning isn’t just a clever marketing ploy, it’s a genuine discipline and one that I want to experience again. I’ll be back. There are two fellas who need a definite mention right here. Robert and Tony happened to mention having a spare place in a caravan in Kinlochleven on Facebook many months ago. Within a few minutes they’d prompted me to book flights, sorted my accommodation and transport and essentially prevented me from kipping in the back of a car the night before the race. I’d definitely have never got round to sorting details without them. Not only that but they were the perfect companions, great craic, good conversation and suitably relaxed yet focused about the whole experience. Thanks lads, and congrats on your performances. The marshals and spectators on course were truly amazing, full of encouragement and support despite being positioned in cold and exposed locations. Nothing beats a cheery comment as you crest a summit, tongue on the floor and jellified legs. I returned many a smile to shouts of ‘come on Ireland’, thanks a million to one and all. And to the lady on the road as we finally left the West Highland Way, what a brilliant character, banter personified! Thanks for the hug and the bottomless enthusiasm. You people are what make mountain running so great. Finally, as ever, to my fellow competitors. Calling them rivals would be so wrong. At one stage on the epic second climb I put in a short spurt up a steep corner to make a passing maneuver but got my angles wrong and essentially stumbled directly towards the runner. He could’ve rightfully shouldered me out of the way but instead paused, put his hand on my back and pushed me on ahead, what other sports display such selfless sportsmanship? That shared respect is so great to experience. Next up is more Skyrunning with the Mourne Skyline, a brutal yet beautiful course and a title to defend, I can’t wait!